Try this magical tonic for strong bones! The milk…The broccoli and… The Walnuts… They all provide plentiful calcium necessary for development and growth of the bones. Furthermore, walnuts are a good source of omega-3 fatty acid that not only protect your heart but also gives you a wonderful skin. Mix 2tsp of corn flour in milk and keep aside. Heat the oil in a non-stick pan; add the chopped onions and sauté on medium flame for a minute. Add the broccoli and sauté on a medium flame for 2-3 minutes. 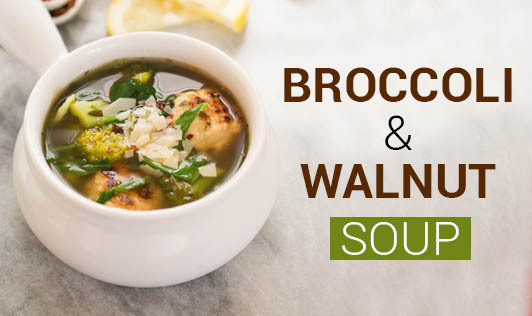 Add 2 ½ cups of water to it and cook until the broccolis are done, while stirring occasionally. Once done, cool the mixture and blend it in a mixer along with potatoes to make a smooth puree. Transfer the puree into a deep pan, add milk and bring it to a boil and season it with salt and pepper. Garnish with chopped walnuts and serve hot.